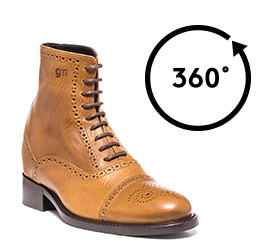 The new "Kohlmarkt" elevator boots by GuidoMaggi are characterized by their unique upper in full grain cognac leather, hand punched in order to get the refined "Brogue wing tip". The inner lining is made of soft goatskintheinsole, midsole and outsole in genuine Italian leather, are assembled and sewn at sight. The heel is in genuine leather with anti-slip rubber, the laces are cotton waxed. The invisible height increaser - 100% natural rubber - can be choosen between 2.4, 2.7, 3.1, and 4 inches, depending on needs.